Since pre-industrial times, methane levels in the atmosphere have risen from around 715 parts per billion to nearly 1800 ppb, claims Folberth. "If methane could be taken back to pre-industrial levels it would bring about half a degree of cooling and would be equivalent to removing one-third of anthropogenic carbon dioxide," says Folberth. Furthermore, the cooling would take place within 10 years. Where might be the chemical options for a material that would absorb or adsorb ambient methane? There is none. Alkanes are very hard to activate. They require either free radicals, or coordinated unsaturated sites either in the molecule or on surface of solid. But in both cases, the atmosphere contains molecules that will react more readily. However, the average life-time of methane in atmosphere is quite small, less than 10 years. Granted the highest uptakes are at high pressures (1 bar ~= 1 atm), and the graph is somewhat muddled at ~1 atm, but this material sorbs (much) more than its own volume at that pressure, and there are other examples. It is a somewhat new class of materials (~20 years). One of the first to be synthesized is MOF-5, which wasn't that useful but served as a good prototype example for future syntheses. But there are a ton of them that have been synthesized to date. They are crystalline materials that are made by self-assembly of metal cations and organic ligands (usually). Some have even been made with light elements e.g. beryllium. All of my graduate research thus far (1.5 years) has been studying the mechanism of gas sorption in MOFs. 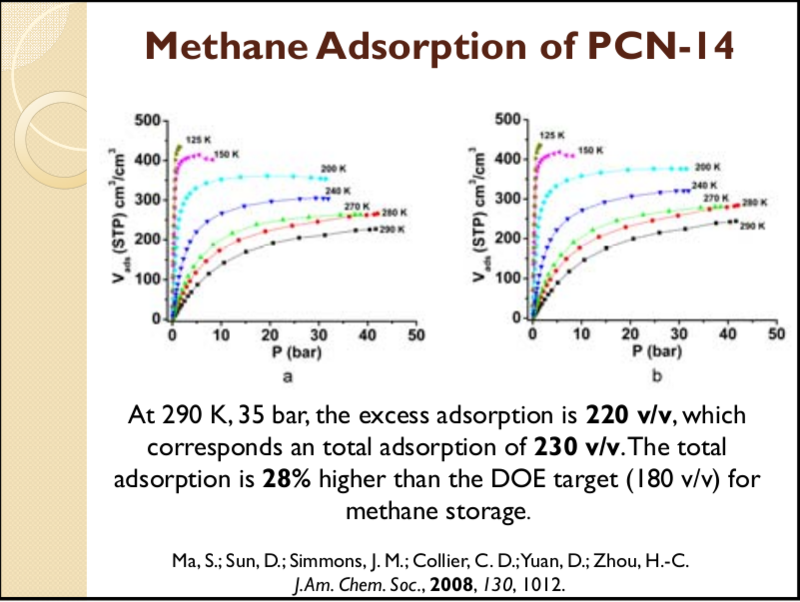 Many can physisorb methane, hydrogen, carbon dioxide, nitrogen, and other gases quantitatively. To be specific, several can do so with methane at ambient T/P. Many copper MOFs, for example, induce a pretty strong interaction (thus binding effect) with hydrogen gas, which is not easy to contrive. Not the answer you're looking for? Browse other questions tagged environmental-chemistry absorption or ask your own question. What element or compound could be used to make the ocean more basic?